I always thought that the quote went “I’ll try anything once” and it was Andy Warhol who said it. Apparently the quote is “I’ll try anything once, twice if I like it, three times to make sure” and it belongs to Mae West. Living in New York, amongst other things, pushes you to try something for the first time ever almost every single day. Here are three things I recently tried for the first time, mostly under pressure from New York City. Probably every New Yorker that looks even remotely Semitic in appearence has been repetidly asked “Are you Jewish?” by the Hasidim. If you answer yes, you’ll get a Billy Mays-worthy pitch to pray/light Shabbat candles/put on at Teffilin. I will admit to occasionally denying my membership in the tribe when in a hurry, but most of the time my answer is “a little bit”, followed by a firm sticking to plain cowardly agnosticism. Ever since I wrote a long and rambling post about Tefillins, I meant to put one on. So this one time, after being approached by a young Hasid in the Atlantic station passageway, and customarily declining his pamphlet, I accepted his halfhearted offer to help me lay Teffilin. He was particularly surprised – I don’t really think he gets to help a lot of people perform this particular mitzvah a lot. He produced a Tefillin set from a black shopping bag and a loaner kipah from a pocket, helped me put it on and say the necessary prayers right there on the BMT’s Atlantic Avenue platform, amongst the hustle and bustle of people and trains. It felt strange, yet somehow very comforting – performing this ritual in one of the most familiar places to me. He also gave me a pamphlet in which the Lubavitcher Rebbe explains to a computer science professor that Tefillin is a symbolic representation of computers. He was very glad to be able to accomplish such an epic mitzvah. I was walking through Union Square farmers’ market, already having sampled and bought a package of organic bacon hawked by an upstate hippie (I’m not a very observant Jew as you might have already noticed in this post). I was passing by a little stall providing free samples of wine made by hippies somewhere upstate. That bit of hippie bacon called for some wine, but I did not want to fight the mob of greedy Manhattan housewifes for a tiny sip, but then I heard a magical phrase – “We also have dandelion wine”. I never really finished reading “Dandelion Wine” by Ray Bradbury, and always thought that there was no such thing – how can you make wine out of bitter yellow flowers? Apparently this is how. I bought a bottle. All I have to say is that dandelion wine tastes just like they say it should: like summer and childhood. I also bought some salad corn shoots that I’ve read about in New York Times. Those tasted like raw corn kernels. You know that nobody really drives in New York because there are too many cars there. I’ve spent many happy car-less years here, but the arrival of a baby forced me to buy a car (a minivan, in fact). Parking is a very sore topic around these parts. I was never willing to splurge on a garage, and had to subject myself to the indignities of alternate side parking regulations. There’s a whole book about parking in NYC – Calvin Trillin’s brilliant Tepper Isn’t Going Out. I bought it only because I have a friend named Tepper, but ended up immensely enjoying it. Which is what I can’t say about parking in the street. Well, recently, I finally broke down and shelled out $200 for a spot in a garage. The feeling on the “alternate” days is rather novel – hey, I don’t need to move a car! Also new – not worrying about what those loud teenagers are probably doing to my poor car, or if there’s a used car window repair place that just received a shipment of my car’s specific windows (did you notice how they always have a used window for your car ready, no matter how obscure, when you go to a nearest car window shop for a mysteriously shattered one?). It’s a new and pleasant feeling. Sugar producers must be reeling from the effects of low carbohydrate diets: how else you’d explained this shining example of sugar marketing that I found recently in my hotel room? That’s right – only 15 calories per serving! It’s a diet food! Ahhh, that set off a whole bunch of childhood memories for me. First of all, growing up in the Soviet Union where most sugar was made out of beets, upon reading about cane sugar in Mayne Reid’s books I thought it to be something super exotic, like the books themselves. Because of that I always associated it with America and adventure, and found the common explanation that cane sugar tasted exactly like beet sugar, except a bit less sweet, (which is indeed the cast) inadequate. Mayne Reid, by the way is one of that breed of writers that are extremely obscure in America, but famous in the former USSR. There Reid was considered to be on par with Jack London, just like Robert Sheckley enjoys popularity equal to that of Ray Bradbury. I mean, come on, Sheckly basically invented the concept of reality television, but this seems like a topic for a whole different post. Back to our exotic sugar. “Grown and harvested on the island of Mauritius”, huh? Generally horribly ignorant of geography I immediately recognized the isle of Mauritius as the location that produced two of the most famous rare stamps known as “Post Office Mauritius” stamps. The highly romantisized story goes something like this: the governor of the tiny British colony wanted to issue some of those newly invented “postal stamp” thingies and ordered a batch from local engraver Joseph Osmond Barnard. The engraver allegedly forgot what copy needed to go on the left side of the stamp and went looking for the postmaster. When he was approaching the post office, he suddenly remembered – “Post Office”, went back and put that on the stamp. The postmaster was massively pissed off – it should have said “Postage Paid”. Most of the stamps from the “error” batch went onto the governor’s wife’s fancy dinner invitations. There is a lot of controversy (read further down) weather “Post Office” was actually a mistake, but mistake or not, the story captured collectors’ imaginations and the invitation envelopes sell in multimillion dollar range today. The postmaster of nearby Mauritius used handstamps to “cancel” postage, but back in those days stamps were sometimes “cancelled” by hand, with a strike of a pen or sometimes with a signature. For instance, the postmaster of nearby colony of British Guiana placed his autograph on every single stamp along with a stamped “cancel”. His autograph on the famous “Penny Magenta” was sold for just under 1 million dollars in the nineties. What makes the story more interesting is that the original owner, Vernon Vaughan, 12, of Demerara (aha! 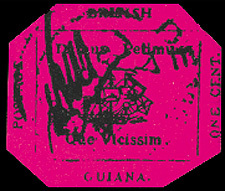 ), British Guiana sold the ugly, dirty stamp that had its corners clipped by somebody probably out of boredom, for an equivalent of a couple of bucks to a stamp dealer. I remember reading about the last sale in the philatelist magazine and wondering who the anonymous buyer was. Only now I learned that it was the crazy du Pont heir that was convicted of killing an Olympic wrestler. Despite what marketing droids and sleazy investment gurus may have lead you to believe, there is such a thing as synergy. Yes, 1 + 1 is sometimes equal to 100. And Henry Kuttner and his wife C.L.Moore are a case in point. Henry Kuttner started out a bad science fiction writer. A real stinker. He had some cool friends though. Howard Phillips Lovecraft was one, Raymond Douglas Bradbury was another. At first he wrote a whole bunch of Lovecraftian tales. Not really bad ones, but completely and thoroughly copying Lovecraft’s style, settings and characters. Well, not many good things come out of copying. Then he started writing and getting in print bad pulp sci-fi and fantasy stories. Yech. Catherine Lucille Moore also wrote crappy fantasy stories. Nothing really worth mentioning. Pulp, dreck. And then they met each other and got married. That’s where the synergy effect came into play. One after another they started publishing stories of absolute brilliance. Real classics. 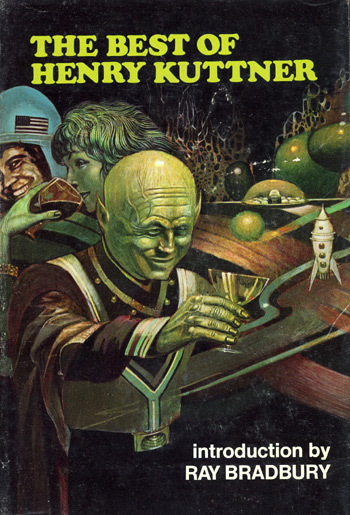 “The Twonky”, “Mimsy Were the Borogoves”, “Nothing but Gingerbread Left” – some of the best short sci-fi stories ever written. An then the “Gallagher” series and “Hogbens” series. Most of these stories were written under pseudonym “Lewis Padgett”, and for a long time nobody could believe that that was really Henry Kuttner and C.L. Moore. Some bizarre rumors about the true identity of the author of these stores still float around on the Usenet. What got me hooked on Kuttner/Moore was a story called “The Proud Robot”. It was about an alcoholic inventor by the name of Galloway. While drunk, he made himself a robot, but then could not figure out what the robot’s purpose was. That became my favorite short sci-fi story of all times. What I didn’t know, there were 4 more stories in the series: “Gallagher Plus”, “The World is Mine”, “Ex Machina” and “Time Locker”. 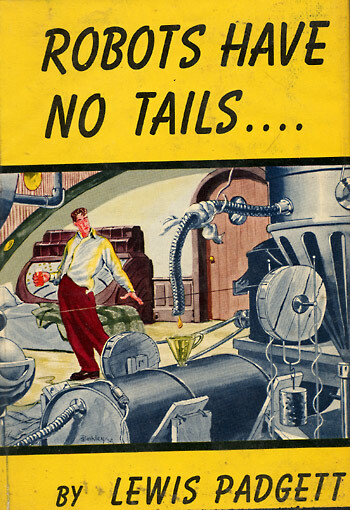 They were collected in a book called “Robots Have No Tails”, of which there were only two editions. The first one (Gnome hardcover), became exceedingly rare (and expensive I might add): you see, in every story Galloway’s alcoholic subconsiousnes was making trouble for sober Galloway. An alcoholic protagonist was not politically correct, and thus the book suffered very slow library sales. I’ve learned two interesting things from less rare second edition (Lancer paperback). The book got it’s name because when Kuttner was asked about the title, he said something to the effect that he did not care even if it was called “Robots Have No Tails”. The second is that Kuttner made a mistake: he called the protagonist Galloway in one story and Gallagher in another. When confronted by C.L. Moore, he corrected the mistake, explaining in another story that Galloway is the first name, and Gallagher is the family name. 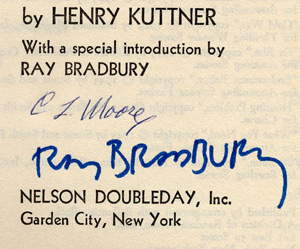 Henry Kuttner died young, at the height of his career. His health was damaged in the battlefields of WWII. The books he wrote with his wife are hard to find, but they are most definitely worth the effort and expense needed to obtain them. http://www.abebooks.com is probably the best place to find them.